What should you do if the insurance company gives you notice that a “light duty” job is available and that you need to return to work? You should assume that your employer’s insurance company will regularly look for reasons to declare you fit to return to work and therefore no longer eligible for TTD (temporary total disability) benefits. Remember that insurance companies advise their customers (your employer) to include insurance friendly doctors on your employer’s posted panel of physicians. They want doctors who will limit your time off work and who will be quick to declare you fit to return to light or full duty. This “return to work” issue, by the way, is where it really makes sense to have an experienced workers’ compensation lawyer by your side. I can offer my clients perspective about when the insurance company’s return to work demand is reasonable and when it is not, and how to try to return without jeopardizing weekly wage benefits. As a general rule, I recommend that my clients be very careful about returning to return to work without a Form WC-240 and WC-240a in hand. Here’s why I feel so strongly about returning to work with a WC-240 in hand? 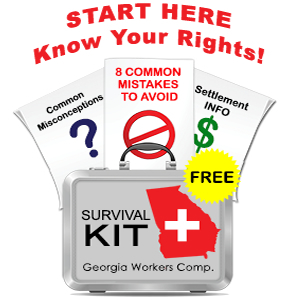 The WC-240 and 204A are Georgia State Board of Workers’ Compensation forms that set out a detailed light duty job description for a light duty job. The details of the job description must come from an authorized treating physician. 1) the insurance company adjustor will review your medical records as they are produced by the doctor (if you didn’t know this already, your medical records in a workers compensation case are not confidential – the insurance adjustor gets a copy). 3) the adjustor will contact your employer and ask if there is a job available that fits the limitations set out in the WC-240a. 5) if you attempt to return to work under the WC-240a restrictions (and usually I recommend to my clients that they try to return) and within 15 days, you decide that you cannot perform the light duty job, you can inform your supervisor, return home and your TTD benefits will resume automatically. The employer can, of course, attempt to terminate benefits, but you continue to receive those benefits while you are waiting for your hearing. If, however, you return to work without a WC-240 and 240a, and you cannot perform the job offered you, and you return home, your TTD benefits will not automatically resume – instead you will have to file for a hearing, and wait two to three months for you case to be scheduled, and you will have no TTD income benefits while you wait. Workers’ compensation insurance companies know that if you have no TTD income benefits coming in, you will be short of money and likely willing to settle your case for less than it is worth. In my view, this “return to work” issue is one of the more important considerations in a workers’ compensation case and one where knowledgeable legal advice is a must. Don’t know where to begin? Get this Survival Kit now. It will help you avoid common mistakes and guarantee the best chance of winning.